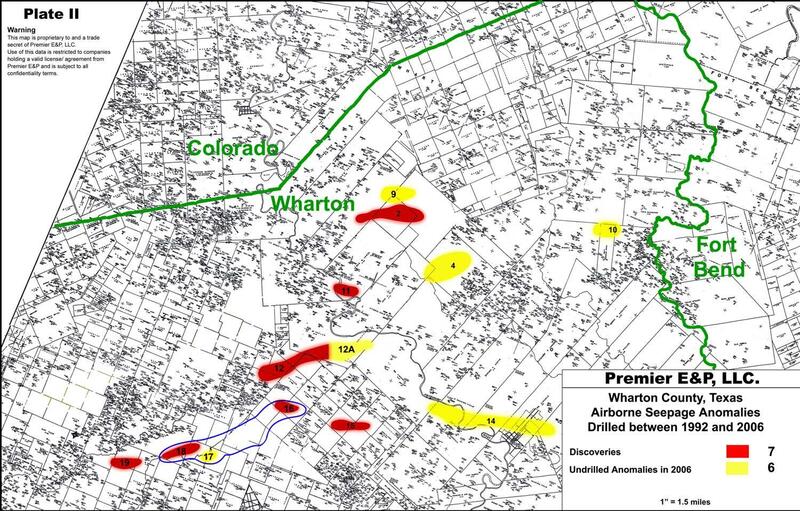 Premier E&P, LLC conducts contract exploration identifying, mapping, and leasing prospects for funding parties. Beginning in late 1992 the principals of Premier invested their time and capital mapping atmospheric seepage in several basins in the United States. One of these was a research survey of Wharton County, Texas. Premier mapped 450,000 acres and identified 55 areas of seepage. There were twenty-two (22) seepage anomalies associated with production. In April of 2003, after having studied the area for 11 years, Premier concluded that forty (40) anomalies were most likely related to leaking hydrocarbons. From 1992 to 2003 eight (8) seepage areas had been drilled by industry proving they were above hydrocarbon accumulations as Premier interpreted. There were still thirteen (13) undrilled with targets being either Yegua or Wilcox and eight (8) that had both Yegua and Wilcox as targets. Below are some examples of undrilled anomalies and drilled discoveries with their corresponding production. Send mail to webmaster@PremeierE-P.com with questions or comments about this web site.